With a one way in, one way out path, a labyrinth is showing and teaching us centeredness. This is what makes a labyrinth unique from a maze which has many paths & dead-ends leading to confusion. Walking the labyrinth is to experience that inner stillness, as the labyrinth’s intricate steps gently take the conscious mind out of the way. Labyrinths may be created with stone, tape, fabric, sticks, chalk, plants, and many other materials. 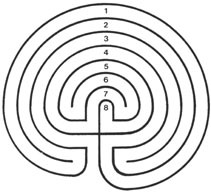 "Finger labyrinths" are also rising in popularity, as small wooden or metal plaques on which the labyrinth pattern is traced with a finger or a stylus. 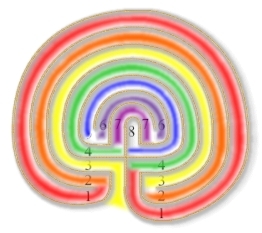 The seven circuits of the classical Cretan Labyrinth pathway have also been associated with the seven primary chakras of the body. Notice the sequence of the paths is 3-2-1-4 and 7-6-5-8 which repeats itself twice. This pattern goes from left to right making the brains left and right hemispheres alternate. Imagine tracing that path with your finger and notice the concentration it takes. That’s why it has been a sacred meditation tool for more than 1000 years. 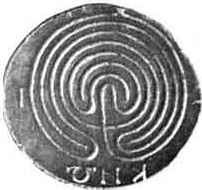 There is much symbolism associated with the Chartres labyrinth. 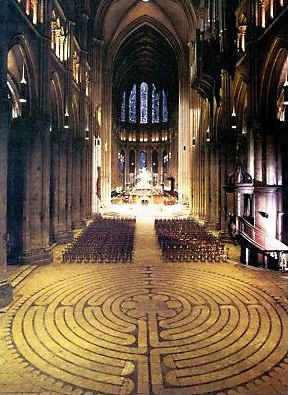 The Chartres labyrinth is found in the Cathedral of Notre Dame in France. It was installed in the cathedral around 1205 AD. The labyrinth is an example of what is called Sacred Geometry the foundation for the building of all of the Great Cathedrals of Europe and England. 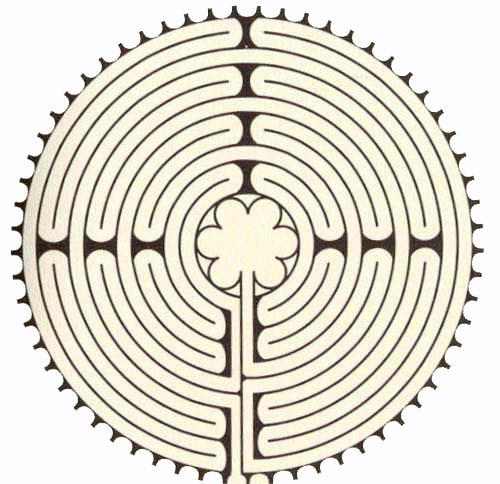 In ancient cathedrals, the labyrinth was either embedded in the floor or placed on a wall at the entrance where worshippers could trace its pattern with their fingers before entering, thus symbolically and actually leaving the cares and concerns of the world behind in order to be receptive to divine wisdom, peace, clarity, acceptance, love. It is circular in shape with eleven circuits. There are no dead-ends. The path goes back and forth until, when one reaches the 6-petaled rose in the center, it is always a surprise. It stills the conscious mind so that deeper consciousness and wisdom can come forward with insights, perspectives and understandings that are important to you now. These are things you already know, but cannot get in touch with because of the busy-mindedness of everyday life.